We use the Autosmart ranges of valeting products. Autosmart supply's the trade all over the world and are thought of as having some of the best quality products available. We also use various Autoglym and Simoniz products to get the best results, you can be sure that your car will look fantastic! A full deluxe valet usually takes between 3 to 4 hours. What Valet should I go for? Really that is up to you. What does your car need? Is it dirty both inside and out? We usually recommend our most popular valet, the deluxe valet, as this covers everything, and we pride our selves on really putting in the effort to bring your vehicle back to showroom condition, as much as possible. Can you come to my work? 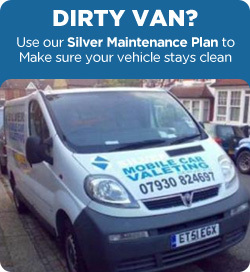 Yes, we are mobile and will come to your home or place of work, or even a car park. Our van has it's own supply of electricity, and is fully stocked with the best available valeting products. The only thing we require from you is your key! We are based in London, if we have to travel more than 20 miles, a small extra charge will be required. We can provide an excellent job but not excellent weather conditions, so in an event of extremely bad weather, we will rearrange another convenient date and time. We are available 6 days a week, from 8am to 5pm, and later in the summer months. All you have to do is call us to book your valet. We usually need two or three days notice, however in some cases a next day service is possible. We are based in London and cover near surrounding areas. We do travel further for a small extra charge. Can you do a valet cheaper if I book every month or so? Yes we can, just ask when we have completed your first valet. Also should you want to tailor a valet package more to suit your needs, we can do that also. We can offer a discount if we are doing more than one vehicle at the same address. Do you do any 'special offers'? We do from time to time, although we always try to keep our prices as low as possible. Please look out for our special offers page, which we update on a regular basis. 10% Discount on all booking this Summer. Hurry! Offer ends 31st July 2018. Use discount code SummerValet10 during checkout.